Getsmartcoders has over 10 years of experience in the design and development of solutions for lead management. We leverage big data analytics, machine learning and software development to create a holistic solution that gives you a score-based system with advanced reporting features. The diverse functionality of our solution enables you to categorize and prioritize your leads according to the possibility of them turning into a revenue-generating potential. We use a well-calibrated system to rank and generate lead scorecards and streamline your sales and lead management process for maximum success. As a premier Lead Scoring Solutions company, we fine-tune our services based on a thorough understanding of your requirements and the nature of your work. We blend of smart cognitive features, cross-platform flexibility and connectivity and performance to develop a customized solution for your needs. Our solution develops and improves over time, based on the data it accrues over time, to transform your lead management process for maximum profitability. Our solution takes into account variables such as customer interactions, queries and the level of interest to provide you with insights into managing them. This enables you to send customized Emails based on the inputs delivered by the reporting system. You can design your sales campaign for your prospects based on the insights received through lead nurturing strategy. Using customer analytics and self-learning features, our solution prioritizes leads based on the chances of them turning into revenue generating customers. You can customize your marketing and sales campaign based on how the system categorizes your database of leads. As a lead management tool, our solution can be used to perform lead categorization benchmarks as determined by you. The system utilizes a dashboard and a reporting-based architecture to help you understand which one of your leads require action. You can determine who needs follow up emails or a meeting based on the advanced leads forecasting system of our solution. Your sales team can be optimized according to the lead forecasting system. 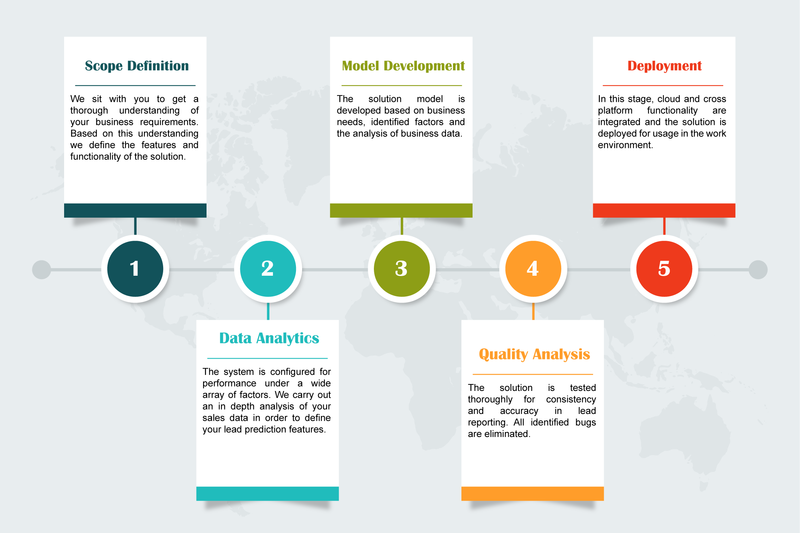 Our solution empowers your sales team with data based on various customer characteristics. We use big data analytics to record information from various sources like your websites, point of sale and social media engagement to determine the level of interest a prospect is showing for your product or service. You sales team can optimize their effort based on the vital insights they receive from the lead prediction and customer analysis features of our solution. An efficient lead scoring process begins with categorizing them according to their life cycle. Leads that are closer to becoming revenue generation customers require more efforts than ones trailing in the life cycle. Understanding which one of your leads requires more attention and allocating resources to them accordingly is the most important aspect of leads management. Automation is far superior to manual task management in terms of efficiency, accuracy and pace of operations. Our solution has the flexibility to integrate into existing CRM systems saving you the costs of upgrading your software. You get guaranteed levels of reporting accuracy that can help you decide on the type of resources you need to allocate for leads to convert into customers. With the use of predictive features that support your customized needs, our solution will fetch for you a list of leads with substantial supporting data. Our solution lets you focus on leads that have a maximum chance of transforming into a customer. You can also keep prospects in the pipeline for periodic follow up. We use end-to-end machine learning based automation solutions, predictive analytics, deep learning and cognitive computing to create a well-balanced ecosystem for lead prioritization. We use popular machine learning prototype development technology like Tensorflow, Numpy and Flask to develop the Machine Learning and Deep Learning modules for lead scoring. These cognitive features give you valuable insights into consumer behavior, user preferences and customer demographics. We also use big data frameworks like Hadoop to integrate advanced predictive functionality into our solution. In addition, we use many other software development frameworks to optimize the performance of the solution to match your organizational requirement. Our solution for automating lead nurturing process will help you get complete idea on customer life cycle. The solution generates lead scorecards and reports based on the probability of a lead transforming into a customer. Our solution enables you to distinguish between leads that need immediate action from low priority ones, based on a feedback based approach to machine learning. We use Python-based frameworks like Django to develop easy to use interface that augments the advanced functionalities of our lead scoring solution. Why Outsource Lead Scoring Services to GetSmartCoders?